Tell the EPA to Protect Our Climate and Health From Dangerous Methane Gas Leaks! President Trump and Acting EPA Administrator Andrew Wheeler are proposing to weaken common-sense rules that stop the oil and gas industries from unnecessarily leaking massive amounts of climate-warming methane gas. This is a blatant giveaway to oil and gas interests at the expense of the American people, our clean air, our public health, and the future of our planet. 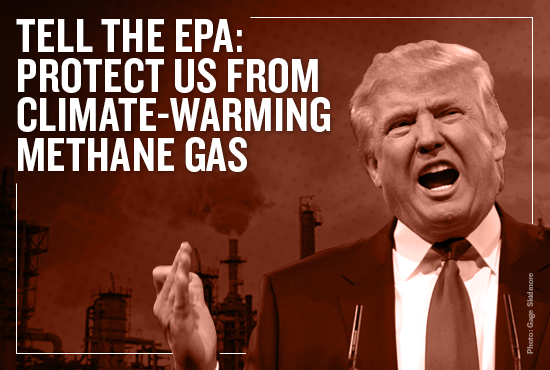 Call on the EPA to reject Trump and Wheeler’s reckless rollback and protect us from methane gas. Call the on EPA to reject Trump and Wheeler’s reckless rollback and protect us from methane gas. Dear EPA officials: I urge you to put a stop to President Trump's plan to roll back New Source Performance Standards that regulate methane gas released by oil and gas operations. Methane gas poses a serious danger to our climate, our clean air, and the health and well-being of our communities. It traps heat in the atmosphere at more than 80 times the rate of carbon dioxide. Toxic and hazardous air pollutants released alongside methane can also trigger asthma attacks and increase cancer rates for residents who live near oil and gas facilities. We must keep strong methane regulations in place to protect communities from harmful pollution. Oil and gas operations are also incredibly wasteful, leaking millions of tons of methane and natural gas each year. Revoking this rule would result in 380,000 tons more methane getting released into the air annually -- the equivalent to the yearly climate pollution of more than 2.6 million cars. Rolling back these standards is a lose-lose. Even fossil fuel companies have admitted that they can live with strong methane regulations on the books. Please reverse course and keep strong methane regulations in place.